Quirkathonic: Weirdest things that happen to you..
Weirdest things that happen to you..
A bloke in only his underwear once climbed from the balcony into my bedroom in inner Sydney when I was asleep on my own (at least he had a good body and was we were both in early 20's). So as not to make him panic and smother me with my own pillow, I said 'can I help you?'... After sitting on my bed, he had a little chat, then climbed back out. Turns out he lived next door and never looked me in the eye again. I understand he was tripping... True story. Weirdest thing to happen to a friend. He was standing waiting for a train on an outdoor platform. It was a hot day so he decided to have a drink from a tap. Turns out that there was a sizable huntsman spider in there. It ran into his mouth and attached itself utilizing those little hairy barby things on its legs’ onto the inside of his cheek. The train comes along, people blatantly staring, whilst he’s jumping around with his hand in his mouth trying to extract the beast. He did get it out, although the train had gone, and it didn’t even bite him…! 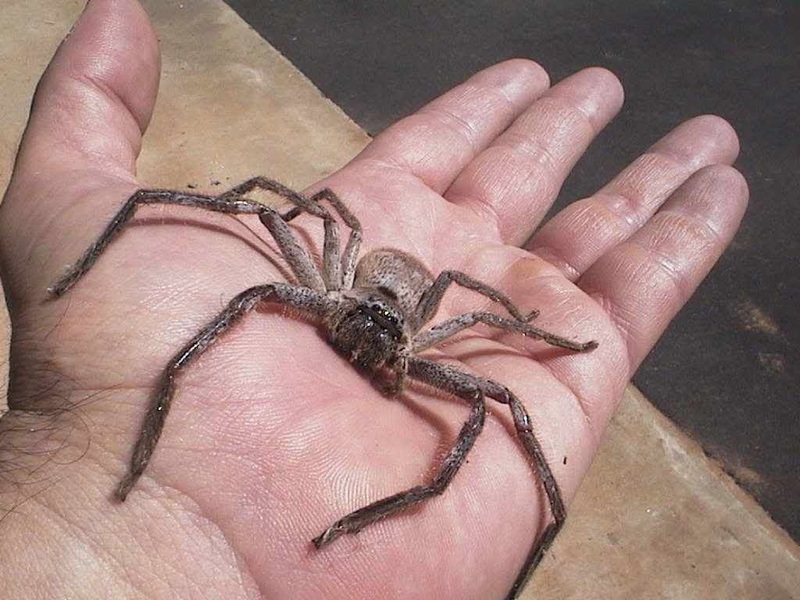 Here's an example of a huntsman spider, although it's not the actual perpetrator.